The Gallery is clearly the core marketing asset of an app’s Product Page on iOS. It occupies the most dominant real estate on the page and therefore plays a crucial role in convincing Visitors to install your app. In fact, our tests with leading mobile developers have shown that an optimized Gallery on the Apple App Store can boost conversion rate (CVR) by up to 40%. 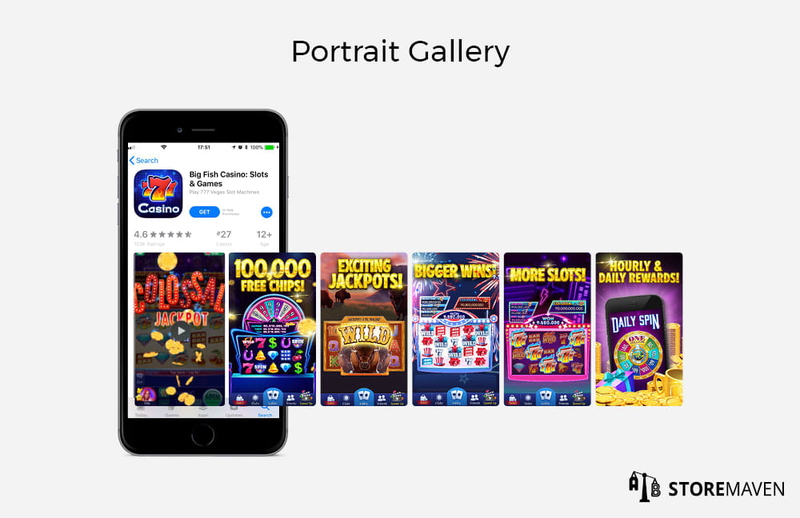 Previously, the Apple App Store would display all Gallery assets in portrait format regardless of whether you had landscape-oriented Screenshots. It wasn’t until 2015 that Apple enabled app publishers to actually display their screenshots in Portrait (vertical), Landscape (horizontal), and Hybrid (both vertical and horizontal) orientations. Each orientation alters the layout and visibility of Gallery assets on the Product Page and in the Search Results page—and comes with their own sets of advantages and disadvantages. So, which orientation converts best for your app? Before getting into the advantages and disadvantages of different Gallery orientations, it’s important to understand App Store visitor behavior patterns. 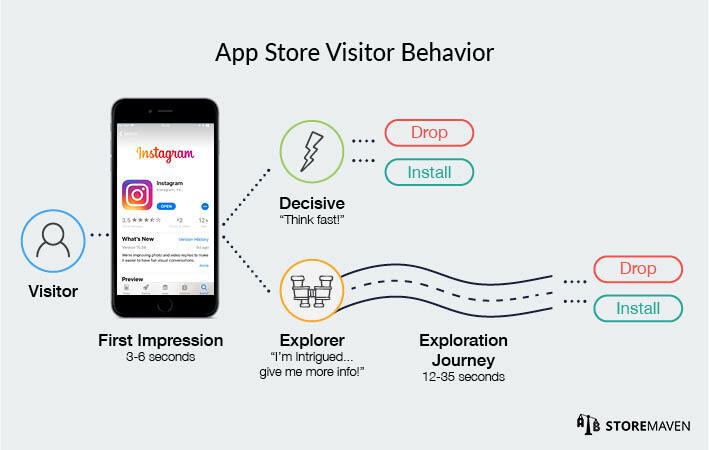 Decisive Visitors: App Store Visitors who decide to install or leave your app store page without ever engaging with the page. In other words, these visitors are only exposed to creatives that appear in the First Impression Frame (everything above the fold), and their only action is either tapping the install button or leaving the page altogether. Decisive Visitors make up 60 percent of App Store users. This makes your First Impression Frame extremely important, and a top priority in your App Store Optimization (ASO) efforts. Exploring Visitors: App Store Visitors who choose to browse through available content in your app store page in an effort to make a more informed decision before installing. Because Exploring Visitors are exposed to more information, they are often more excited about your app and, in turn, boost higher post-install KPIs. This makes optimizing for Exploring Visitors equally as important. They make up the other 40 percent of App Store users. Now that you have a solid understanding of behavior patterns, let’s explore the nuances of each Gallery orientation. In the Apple App Store, we’ve found that 95% of the top apps utilize Portrait Galleries. For games, there’s a little more diversity, with 63% of the top games utilizing Landscape Galleries. 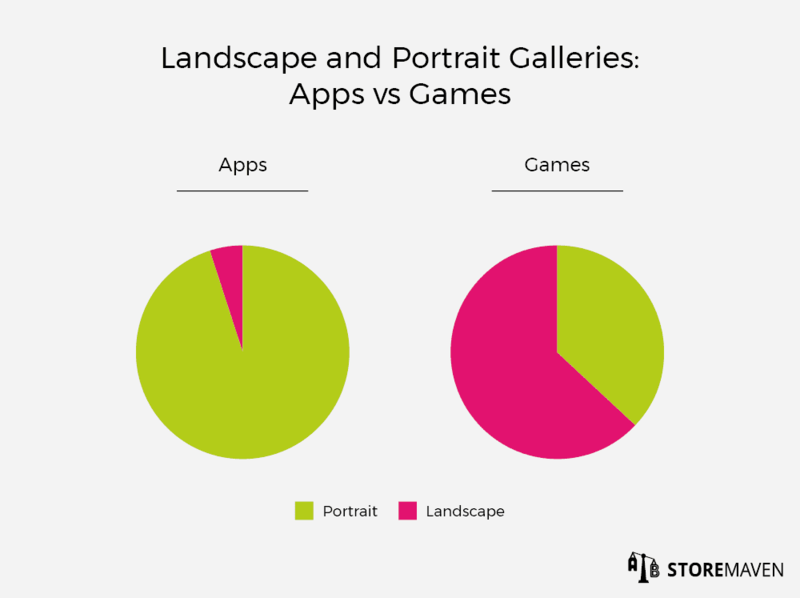 Based on these findings, it’s clear that developers of non-game apps are more inclined to use Portrait Galleries. This makes sense since most apps don’t support horizontal UI, and when App Store visitors search in non-game categories, they expect to see an accurate depiction of how the apps function. Apps are also more reliant on showcasing multiple features in order to garner installs, which (as you’ll learn below) is more effectively done in a Portrait Gallery. However, this opens up the opportunity for apps that do support a horizontal view (e.g., entertainment, sports, or education apps) to differentiate themselves and utilize a Landscape Gallery. Since the consumption of their media content is typically done in landscape orientation, apps like HBO or Netflix can test a Landscape Gallery to show a glimpse of the unique, high-quality watching experiences that visitors get when they download the apps. With games, on the other hand, there is much more variety in the orientation in which they are played, and many games rely on strong brand recognition (e.g., games based on popular TV shows or movies) or category association (e.g., “role-playing” games that attract a niche audience) to drive installs. These characteristics give developers more creative freedom to test how they want to showcase gameplay, storylines, and main selling points. Additionally, gamers tend to be more qualified App Store visitors when compared to non-game app users. That is, gamers typically know what they’re looking for, are highly engaged, and are actively (and selectively) looking for games based on their specific interests. These are important traits to keep in mind when deciding on Gallery orientation since each orientation provides a unique way of conveying messages to your target users. Based on the above differences between apps and games, it’s clear that variety in Gallery orientation is more relevant to games. As a result, this resource will be more heavily focused on identifying which orientation will have the most significant impact on CVR for games. A major benefit of utilizing a Landscape Gallery is that it enables you to focus on one key message. The disadvantage here is that it puts a lot of weight on a single message. If your visitors don’t respond well to that message, they will likely drop from your page. On the other hand, a strong, single message could lead to a large amount of installs. However, this might also mean you’re receiving installs from users who don’t understand the full breadth of the game and could be inclined to uninstall if they realize the game isn’t what they’re looking for. With 50% of installs coming from the First Impression alone, it’s important to understand which assets are shown to visitors when they land on your page. App Store Product Pages that include Screenshots or Videos in landscape orientation have a distinct First Impression Frame. As you’ll notice in the example above, landscape assets, whether they’re Screenshots or Videos, take up the full width of the Product Page. Other than the Icon, they represent a key visual component of the First Impression Frame. A landscape-oriented Gallery also brings your Short Description into the First Impression Frame, which means every Product Page Visitor who lands on your page will be exposed to it. This opens the opportunity to test and optimize your Short Description so Exploring Visitors will be more inclined to click read “more” and expand the full description. Our data has shown that around 37% of visitors who expand the description decide to install, which makes it an important asset to leverage when using a Landscape Gallery. Landscape Galleries have a unique impact on visitor behavior. 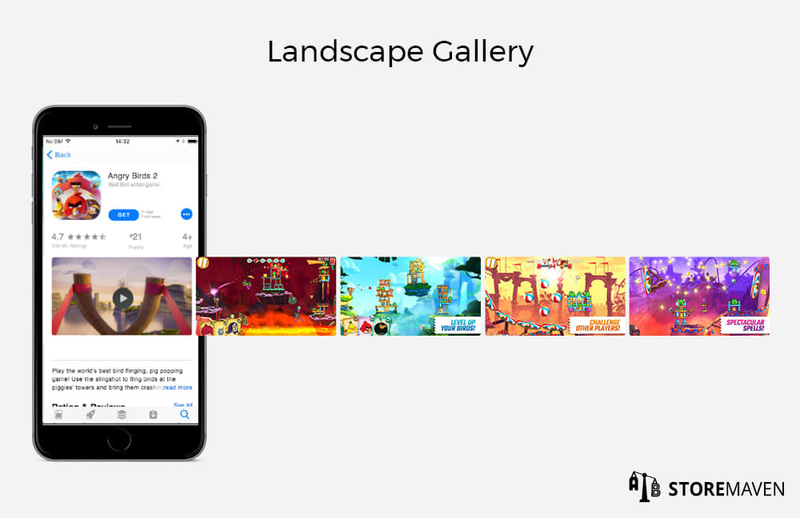 With a Landscape Gallery, visitors are exposed to a fully visible Screenshot or Video without necessarily being encouraged to scroll through the rest of the Gallery assets. Again, this creates heavy reliance on an optimized First Impression Frame and leads to more Decisive Visitors. In fact, our data shows that Galleries with landscape-oriented creatives have 11% more direct install rates compared to Portrait Galleries. This is because visitors assume they have all the information required to make a decision, and they don’t spend additional effort scrolling through the remaining assets. Although decisive behavior is more common in a Landscape Gallery, our tests have shown that there is a 24% higher install rate after visitors scroll through a Landscape Gallery than when they scroll through a Portrait Gallery. For this reason, it’s crucial to optimize the full Gallery to ensure each asset effectively conveys the main unique selling propositions (USPs) of your game so you can capture installs from both Decisive and Exploring Visitors. Another interesting statistic to note is that a majority—over 80%—of games with Landscape Galleries incorporate at least one Video. Since Videos are on autoplay, game developers can showcase different features of the game within a Video compared to a static Screenshot with a fixed message. This is where testing becomes a critical component of your app marketing strategy. It’s the only way to gauge whether showing a Video or utilizing a Gallery with only Screenshots will have the most significant impact on visitor engagement and your game’s CVR. For best practices on designing Gallery assets that convert, check out these ASO tips. The main benefit of using a portrait-oriented Gallery is the ability to display multiple messages or unique selling propositions (USPs). However, it’s important to be aware that incorporating multiple messages can potentially distract visitors from a main value proposition or overwhelm them with messaging if the assets are not tested or optimized properly. One thing to note is that if your game is played horizontally, you can still test the effectiveness of a Portrait Gallery. While it’s true that landscape assets make it easier to show accurate gameplay for horizontally-oriented games, it’s possible to get creative. Clash of Lords 2: Guild Castle is a prime example of a game played in landscape mode that uses a combination of bold captions, character images, and a glimpse of gameplay in the background to captivate visitors with Portrait Screenshots. Similar to Landscape Galleries, the assets in the First Impression Frame of Portrait Galleries are key drivers for CVR and the quality of installs. Since the assets in Portrait Galleries occupy more space in the Product Page’s First Impression Frame, more of visitors’ attention will be focused on the visual components of the page. As you can see in the example above, the first Screenshot or Video and most of the second asset are visible to everyone who lands on your page. This opens the opportunity to strategically test those assets in order to identify the most impactful messages you should display in the First Impression Frame. In a Portrait Gallery, visitors are exposed to more than one asset in the Gallery, which makes scrolling much more intuitive. Our tests with global mobile publishers support this insight and have shown that portrait-oriented Galleries drive 13% more exploration than landscape-oriented Galleries. Among the top Exploration Actions, there is 37% more page scroll (vertical browsing of the App Store page to view assets below the fold) and 32% more Gallery scroll. One way to leverage this exploration activity and maximize conversion is to optimize the order of your messaging so the strongest value propositions are displayed first. 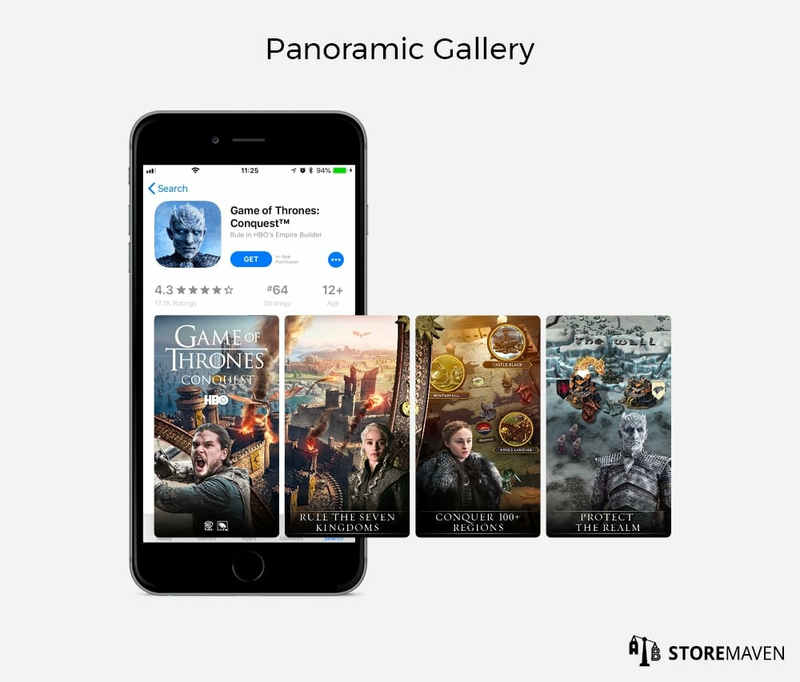 Additionally, Portrait Galleries give you the option to test a Panoramic Gallery in which a design spans across two or more App Preview Screenshots. This can be an effective tactic to grab the attention of Decisive Visitors and encourage additional Gallery exploration from Exploring Visitors. As you can see in the Game of Thrones: Conquest Gallery, they incorporate a detailed panoramic visual of the game’s setting in the background to give a taste of gameplay while also enticing visitors to scroll through the remaining assets in the Gallery. 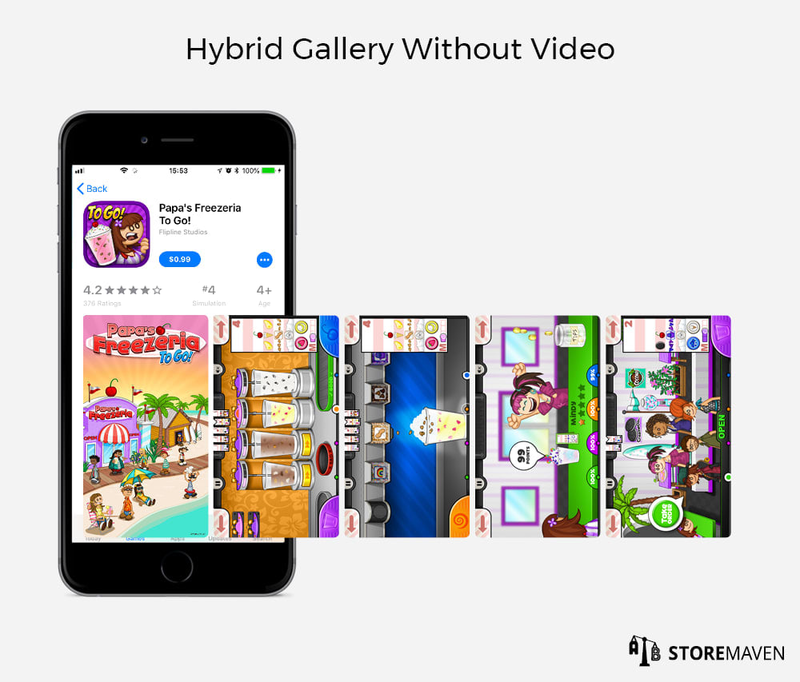 Some games (and many non-game apps) utilize a Hybrid Gallery in which there’s a mix of landscape and portrait-oriented assets. 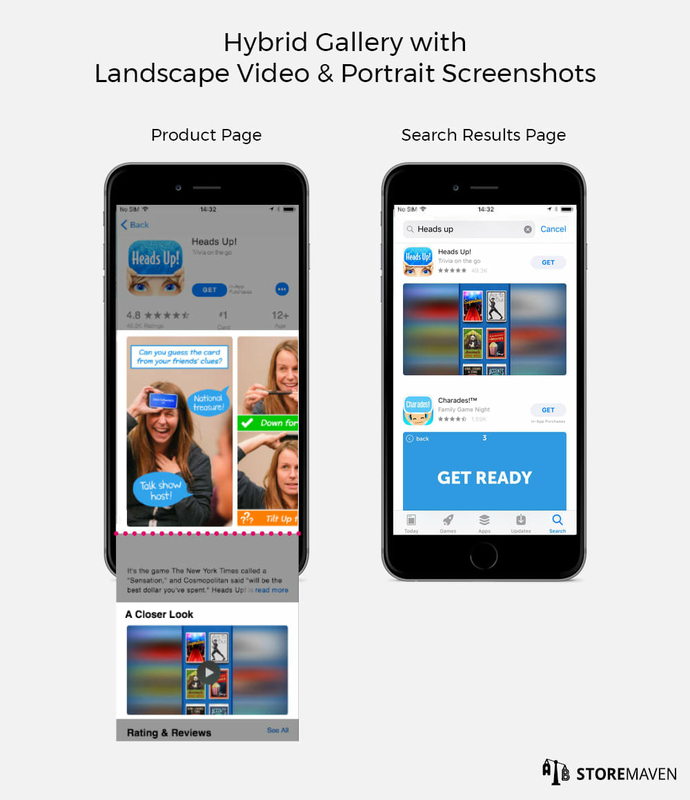 If you utilize a Hybrid Gallery with a landscape Video and portrait Screenshots, you can display multiple messages in the First Impression Frame through portrait-oriented assets while also including a landscape Video that appears below the fold of your Product Page (in “A Closer Look” section) and as the main asset on the Search Results Page. This can be an effective tactic to use if a Portrait Gallery has proven to drive higher CVR, but you have a powerful landscape Video you’d like to display to Exploring Visitors and search traffic. However, Hybrid Galleries aren’t nearly as common as Portrait or Landscape Galleries—only 5% of the top free and paid games currently utilize a Hybrid Gallery. Despite this low percentage, there may be hidden advantages (e.g., increased CVR from search traffic due to a strong landscape Video) or unique user behavior insights that are only discoverable through testing. Using both landscape and portrait Screenshots without incorporating a Video will automatically flip all Screenshots to portrait orientation. This requires visitors to spend extra effort to tilt their phone in order to view the Gallery, which can harm CVR and lead to many dropped potential users. For a full visual guide to hybrid galleries for iOS 11, check out this infographic. 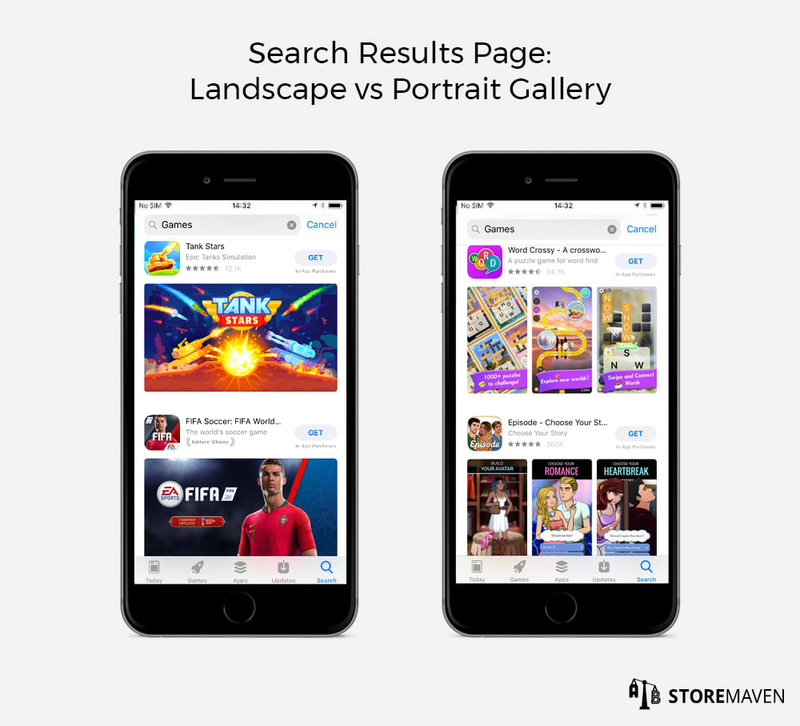 Landscape and Portrait Galleries don’t just affect the First Impression Frame of your Product Page; they also impact how your game appears in the Search Results Page. While you shouldn’t completely overhaul your design strategy to optimize solely for search traffic, it’s important to understand how your game is displayed in the Search Results Page so you can be more strategic when designing and optimizing your Product Page. With a Landscape Gallery, only the first asset appears in search. With a Portrait Gallery, the first three Screenshots or Videos appear in search. As you can see in the example above, visitors are exposed to more messaging in the portrait assets (e.g., Word Crossy and Episode), but the Screenshots are condensed to fit within the same amount of space as the landscape assets. This can potentially create visual clutter and make messaging more difficult to read and understand. Based on those differences, we expect landscape assets to have more of an impact on search traffic. This insight is also supported by our initial testing, in which we found that a Landscape Gallery boosted CVR by 42% from the Search Results Page. However, it’s important to keep in mind that while your search results assets should stand out, they won’t be given as much attention or scrutiny as when visitors directly land on your Product Page. While it’s crucial that your Screenshots are legible when displayed in search, you should be testing and optimizing for visitors who land directly on your game’s page. Now that you’re aware of the differences between Portrait and Landscape Galleries, the only method to fully understand which orientation works best for your game is to engage in consistent and strategic testing. We recommend starting with competitive research to see how other top apps or games in your category use their Galleries to convey key messages. You can use the ASO Tool Box extension to do this quickly and directly from your desktop. 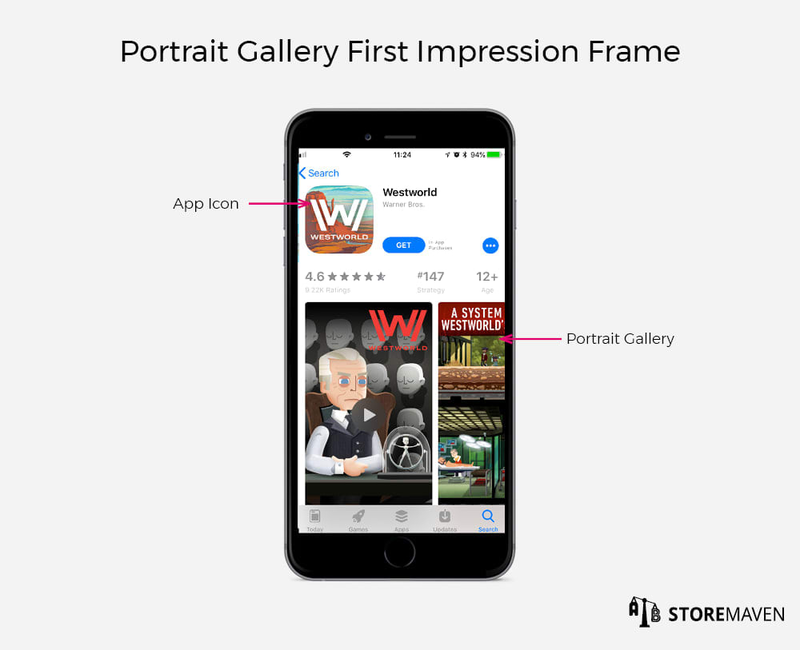 Once you begin testing your own Gallery, you’ll gain invaluable insight into how each orientation influences your target users, impacts their behavior on your App Store page, and subsequently encourages them to install. 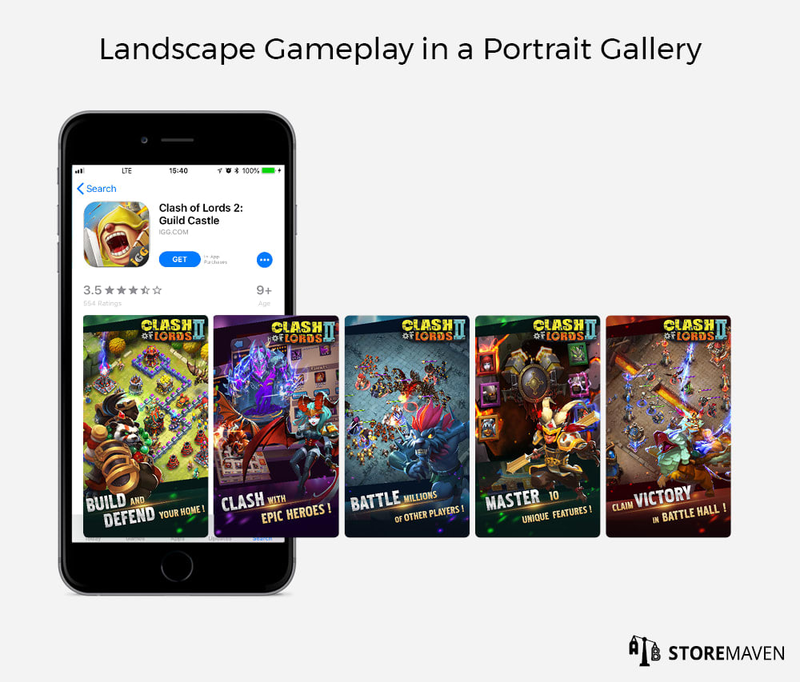 Based on the results, you’ll be able to determine whether a Landscape, Portrait, or Hybrid Gallery will maximize conversion for your app or game specifically. 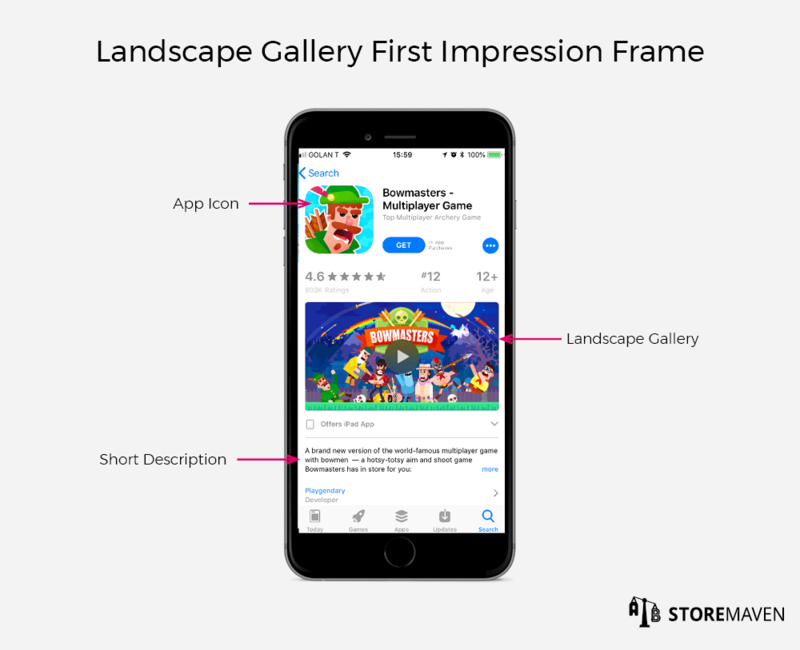 At the end of the day, your messaging is what drives App Store visitors to install, and Gallery orientation is a way of expressing and showcasing those messages. For that reason, it’s essential to implement a strong ASO strategy in order to get the messaging, and the way it’s displayed, right. Have more ASO-related questions? Feel free to reach out at info@storemaven.com.